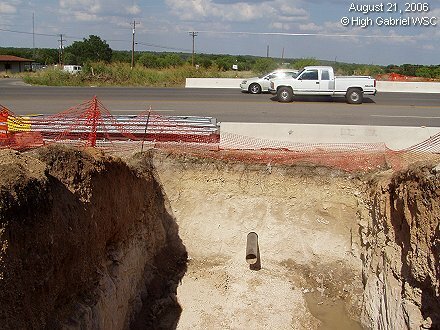 The 183A Toll Road construction project required the relocation of the High Gabriel WSC water line serving customers on the east side of Highway 183. The original 4-inch water line crossed under the highway at Signal Hill Drive. A new 6-inch water line was installed, crossing at Green Valley Drive under the highway to South Gabriel Drive. Large bore pits were dug on both sides of the roadway and a drilling machine was lowered into the pit on the west side of the highway. A horizontal hole was drilled under Highway 183. A steel pipe was then inserted through the hole to serve as a casing for the new water line.